Running a big organization with large number of employees could be a big deal for you if you are not using an employee vacation tracker template. It provides the business management a proper way to track and manage vacations for employees in order to carry out business operations and processes without facing manpower problems. Employee vacation tracker is a vacation management tool used by almost all bug business organizations and companies to manage paid time off (PTO) and emergency leaves. Setting up an employee vacation tracker from scratch sounds like difficult job but having an editable employee vacation tracker template makes the work easier. Hard working employees are one of the great assets of the company or business and a business cannot survive due to lack of competent manpower. It is also fact that employees need time off during their jobs for personal and many other reasons that can cause disturbance at workplace or lack of production but a wise business management always use employee vacation tracker to plan and track vacation of employees in order to stay away from manpower issues and problems. Vacation tracker can be used for both paid time off and sick or urgent work leaves. Whether it is matter of tracing annual PTO (paid time off) or emergency leaves of employees, a detailed employee vacation tracker helps you a lot to manage employee vacation at a place in best way. Through this way you can easily manager alternative employees or workers to carry out the job of an absent employee. 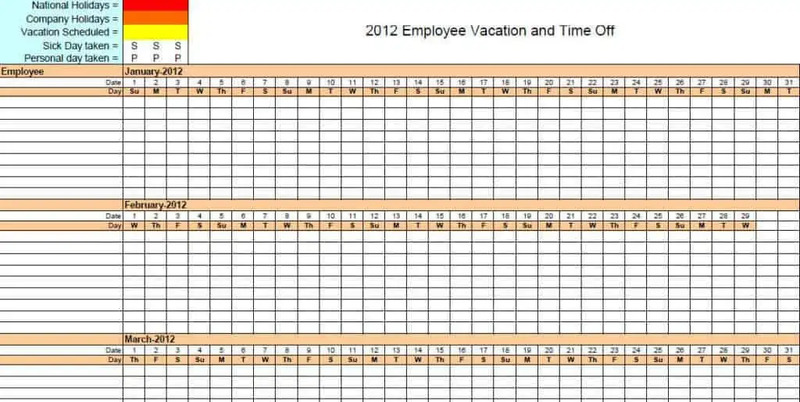 This employee vacation tracker template is very easy to use in MS excel and can also be customize as per individual business needs and requirements. It is loaded with basic excel formulas that will tell you remaining number of leaves of employees and other details at a glance.